Smartphones might seem like the perfect solution when you want to keep your child busy if you have other things to do. The problem is, real phones come with certain risks, and could damage your child’s cognitive development in the long term (source). An ideal solution to this is getting your baby or toddler a toy phone. Because we care about you and your child, we’ve included a buying guide to help you make an informed decision. We have also gathered and reviewed some of the best toy phones for babies and toddlers on the market. From the list, you can choose the one that suits your child best. Use the links above to check the latest prices or read our in-depth toy phone reviews below. The toy phone market is booming, and the variety is simply overwhelming. How do you decide which one is best for your child? What exactly should you be looking for? Though it’s a given that toddlers are intelligent and might take note of your phone, they don’t have a sophisticated understanding of how it works. This means that the functionality and features of a toy phone don’t necessarily need to match the real thing. Toy phones have various features for different age groups. You can consider beeping and light-up buttons, text and talk modes, icons, touch screen functions, large buttons, bright colors, and size. Most of these toys have pretend apps and games. True-to-life display or dummy phones come with a realistic design and are great for toddlers who refuse to play with ‘baby’ phones. Toys inspire imaginative play, and everything about the toy phone, from its colors to its functions should attract. Some toy phones are themed with cartoon characters that inspire children to grow their imagination and pretend to interact with those characters. A baby is bound to drool all over their toy, and a toddler is likely to bang and drop it occasionally. The phone should be durable, with a sturdy case and minimal components that could break. Toy phones usually come with very entertaining features and bright colors. Most are made of ABS plastic, which is safe for babies and toddlers. Display phones, on the other hand, come without any working features. These are incredible for toddlers because they’re hard to damage, even when immersed in water. However, some toddlers may notice they don’t work or make sounds like a real phone and could quickly lose interest. Now that you know what to look for, let’s delve into the market and see what it has to offer. There are so many brands with different types of toy phones, but we have narrowed down the choices to help you out. 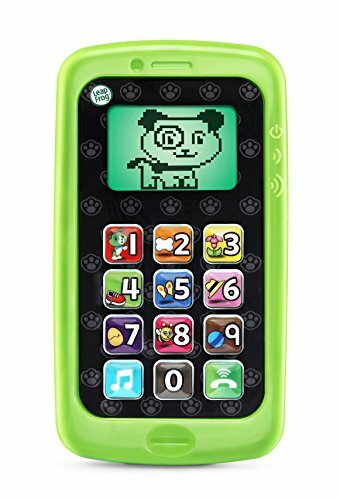 With more than 15 activities, this LeapFrog smart little phone is designed for ages 18 months and over. 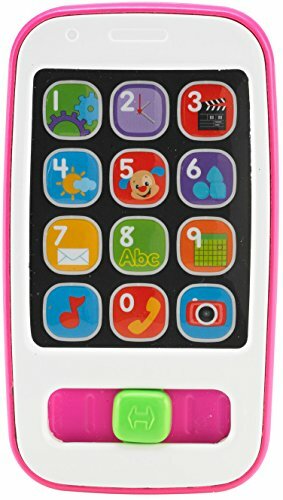 The toy phone features songs about counting that your child can sing along to, and fun animations that will introduce phone manners, numbers, and more to them. It comes with 10 buttons, and one of the best parts is that you can connect with LeapFrog to customize the learning insights. Your toddler will learn early number sense, social skills, and pretend play. 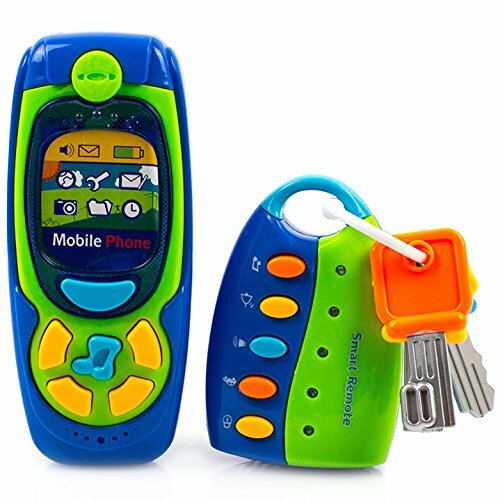 Toysery is a classic toy phone loved by many for its bright, beautiful colors, and the key set it comes with. The phone features different sounds and music that will keep your baby entertained and relaxed at all times. The great design of this phone, which includes brightly colored attractive buttons, will stimulate your baby’s imagination and keep them occupied for long periods. The set is well built, lightweight, and intended for babies of 12 months and up. This retro chatter phone is the ultimate kid’s telephone. The rotary dials are some of the functions that make it so special. It’s been on the market since 1961, and this cute phone never fails to intrigue little ones. Your toddler will fall in love with the way its eyes roll up and down as it moves. The design features beautiful illustrations that give it a vintage feel. You’re also likely to be captivated! The rolling eyes, the mouth chatters, the dial rings, and the colors are mesmerizing for children age 12 months and over. 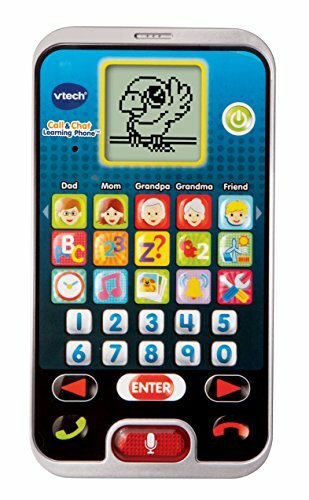 Featuring 10 realistic apps, including music, games, clock, and photos, your toddler will absolutely love this phone. They can talk just like you do on your phone. This toy phone comes with a pretend phone book, a special chat button, and a chatty parrot to guide them through the activities. Designed for age 2 to 5 years, your toddler will learn about time, letters, and numbers with fun games and apps. With five different ringtones and a voice activation feature, your toddler will be busy all the time. 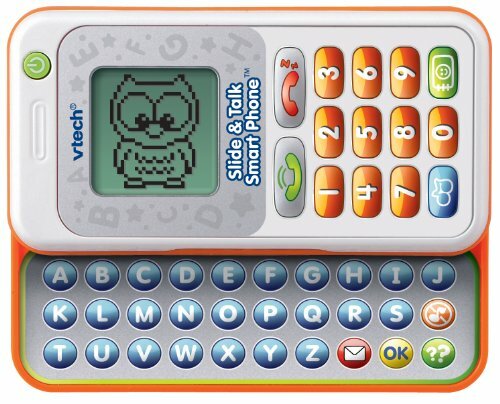 Featuring an animated LCD screen, this VTech slide toy phone looks just like a real phone. It comes with eight activities that will introduce your toddler to letters, numbers, and typing. It’s suitable for ages 2 to 5 years, and your child will love the pretend play. Recorded messages will arrive, from funny characters with friendly voices. The phone comes with a phonebook and your toddler can talk and text as they enjoy sliding the screen back and forth. This is one of the most interactive toy phones on our list. It features several different modes, including music, dialing, hang up, and standby mode. The toy is designed for babies aged 6 months and above. It comes with sweet music and funny voices that will stimulate your baby’s senses. You get six classic rhymes, and different colors to stimulate your baby’s visual development. The buttons light up when pressed, and they keep the baby engaged as they learn. This is designed with a magnifier screen and a colorfully beaded dial pad that encourages imaginative and interactive play. 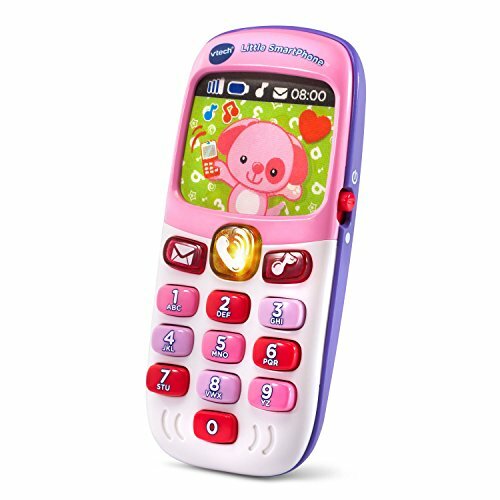 This toy phone is suitable for children of 12 months and above, and it helps develop cognitive and dexterity skills. It’s made of sustainable rubberwood and coated with a non-toxic finish. What’s more, the colors are made from a vegetable dye, which makes it completely safe for your child. Featuring 12 large app tile buttons, your baby will love this phone. It has more than 20 sing-along songs, lights that dance to those songs, and phrases to teach your baby counting, greetings, numbers, and more. The sleek and slim design allows for easy handling, and the moving slider makes song activation easy for a baby to move. Your child will learn motor skills, as well as hand-eye coordination from the slider feature. For ages 6 to 36 months. 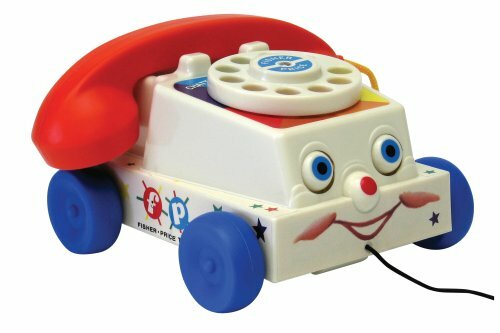 Designed for ages 6 months to 3 years, this is an incredible toy phone. It comes with pretend voicemail, button light-up, music, and a holographic image of a puppy your child will fall in love with. It’s small enough for your baby’s hands, and the buttons are large and colorful, to catch and keep their attention. 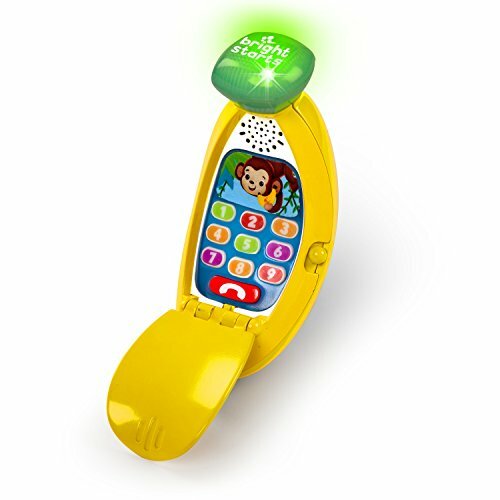 The toy phone features two sing-along songs, eight melodies, and an automatic shut-off feature. 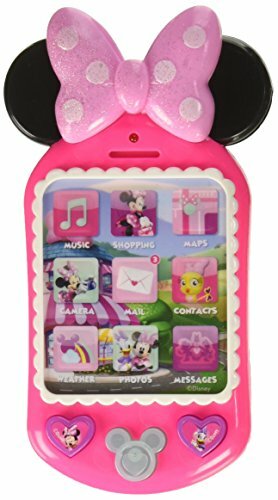 Toddlers love Minnie Mouse and, with this cell phone, they’ll be too engrossed to become bored. It features several Minnie phrases, very realistic phone sounds, a large keypad, and lights. It’s recommended for ages 3 and up, and is the perfect toy phone for big imaginations. The phone is designed with a cute Minnie hair bow at the top, and it has even cuter Minnie buttons at the bottom. The screen is colorful, with several apps on display to keep your child captivated. A banana-shaped phone is definitely something most children will love to play with. The phone opens in a peeling motion and features an image of a monkey on the screen. It comes with 10 buttons that activate light, phrases, and music when pressed. 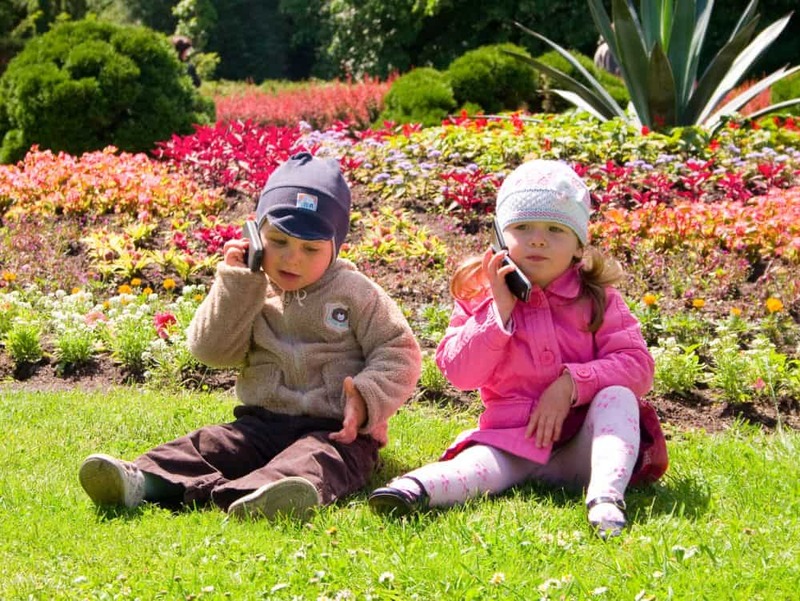 The phone stimulates imaginative play as your little one can mimic how you make calls and play games. It’s designed for babies from the age of 6 months and above, and when it comes to giggles, it truly delivers. 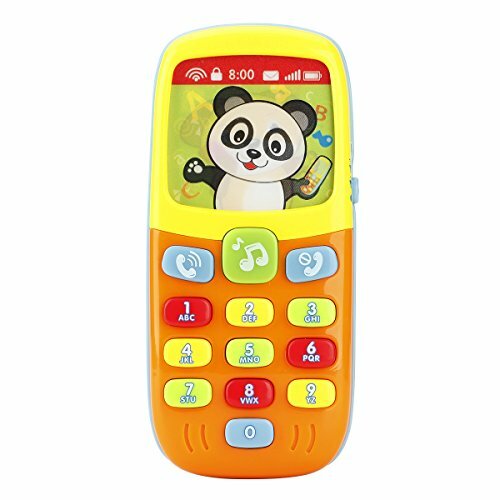 Designed for toddlers from the age of 2 and above, this phone allows your toddler to talk to Daniel and five of his friends. 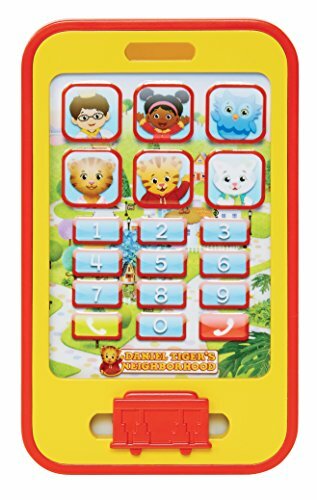 Most children adore Daniel Tiger and this phone will not disappoint. It comes in bright orange and yellow colors, and features character phrases, sounds, and songs. This phone is not only good to look at, but will help your child use their imagination and make sense of their world. 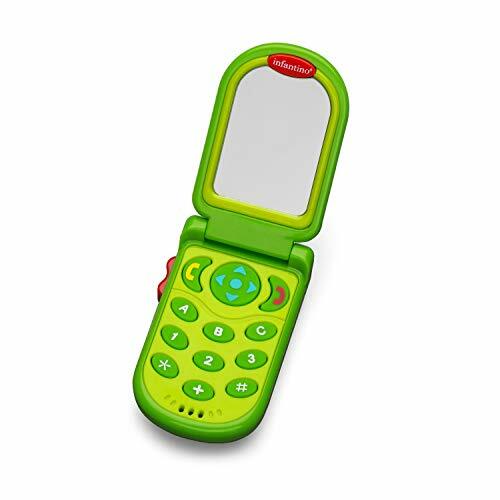 The Infantino flip and pick phone is one of the best toy phones for babies. Flipping is fun, but your baby also gets to hear sounds, phrases, and greetings to keep them occupied. One unique feature of the toy is the bilingual feature that allows English and Spanish learning. 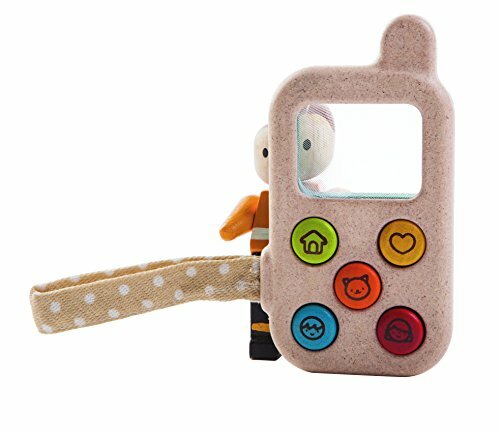 The toy is also tiny enough for your baby to hold comfortably and includes a peek-a-boo mirror your baby will love. It comes in beautiful and vibrant colors, and an incredible design your child will love. Now you can easily make an informed decision. Toy phones are an incredible, safe alternative to your expensive smartphone. They not only provide entertainment, but also encourage pretend play, and stimulate your child’s senses. Plus most will encourage working on numbers, letters, and singing at an early stage. Our number one contender on the list is the LeapFrog Chat and Count Baby Phone since it has so much to offer. Your child will learn social skills and have great fun at the same time. All the phones on our list of best toy phones for babies and toddlers are great fun and made with safe materials. Your child will be busy playing with a safe toy while you attend to other matters, and you’ll save your phone and protect your child from harm. It’s a win-win situation. Did you have the Fisher-Price retro phone as a kid? I’m sure many of you will answer yes – I did and I remember it well! Which is your favorite from our list, and why? Please leave a comment below — we would love to hear from you!